The Memorial Gates were erected to commemorate the members of the church who died in service or were killed in action during World War Two. The Memorial Gates and Fence were opened and dedicated by Archbishop Mowll on 19th November 1949. The gates have since been removed and only the pillars and fence are remaining. 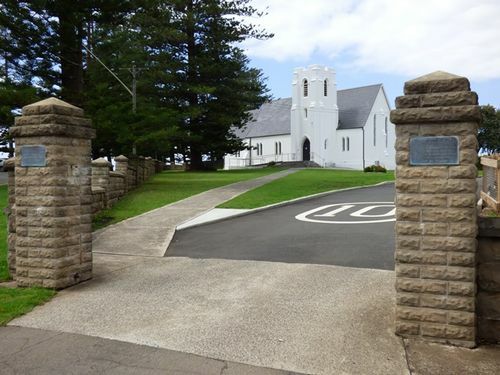 There was a large gathering at Christ Church, Kiama on Saturday last to witness the dedication of the new wall and Memorial Gates by the Archbishop of Sydney, the Most Rev. H. W. K. Mowll, D.D. The Dedication took the form of a service in the Church after which His Grace and the congregation moved to the grounds for the actual dedication. In welcoming the Archbishop, the Rector, Rev. K. L. Loane, said the parishioners were very pleased that he had found the necessary time to make the trip from Sydney. He also mentioned, that the Memorial Gates had cost £109 which was the only appeal they were making to the parishioners and he hoped there would be a ready response. The address was given by Rev. H. W. K. Mowll who took as his text the 21st.chapter of Revelations. He said they had gathered for the dedication of the wall and gates which had been erected in memory of those who had laid down their lives, for their country. The panels were in memory of the citizens who had set a grand example in the past. The Rector thanked all those who had helped to make the function a success and traced the movement over the past 10 years to have the fence erected. Kiama Independent (NSW), 26 March 1949. The Most Reverend H. W. K. Mowll, D.D.